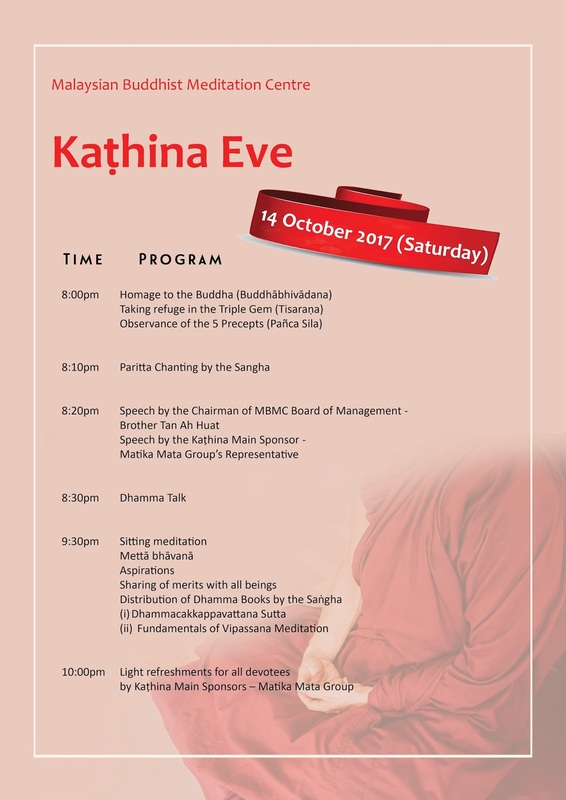 Devotees who would like to donate for the printing of the book may do so at MBMC office. The annual novitiate program opens for registration now. 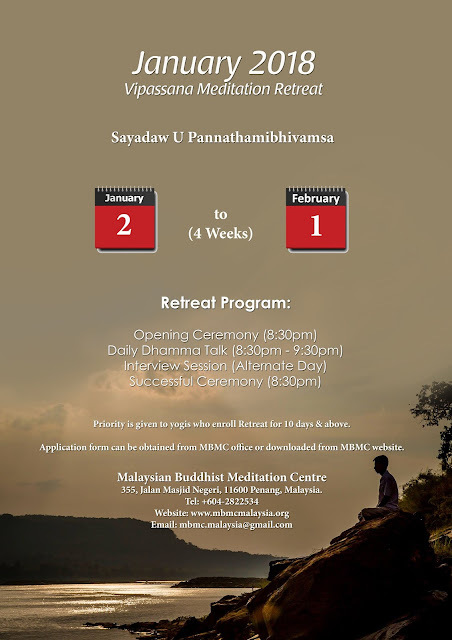 Anyone who is interested, please download the yogi application form, fill up and submit to mbmc.malaysia@gmail.com. 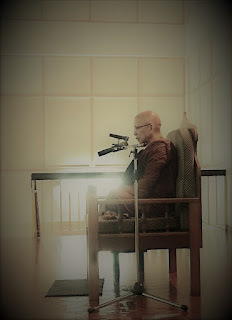 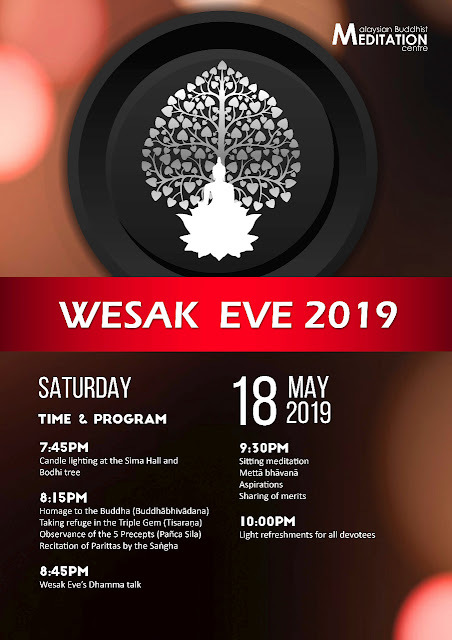 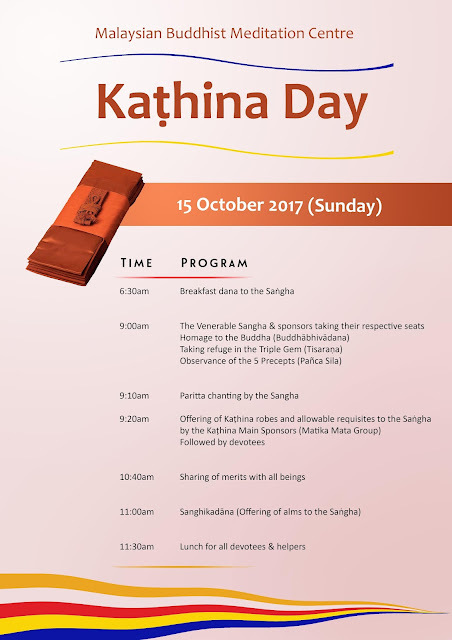 You are also encouraged to join the daily 8.00pm to 9.30pm Dhamma talk session. 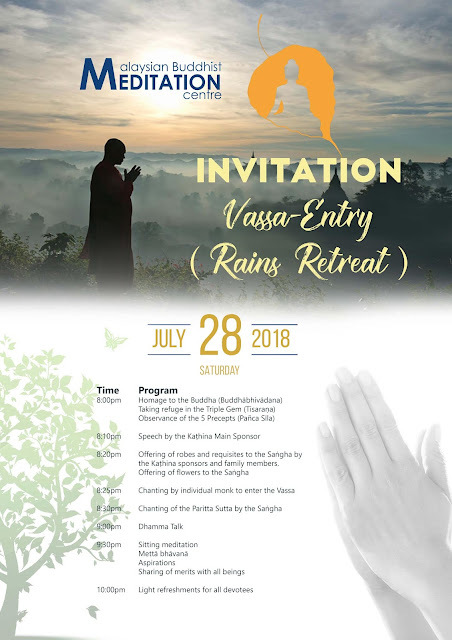 You are welcome to attend the Rains Retreat program, detail can be found in the poster. 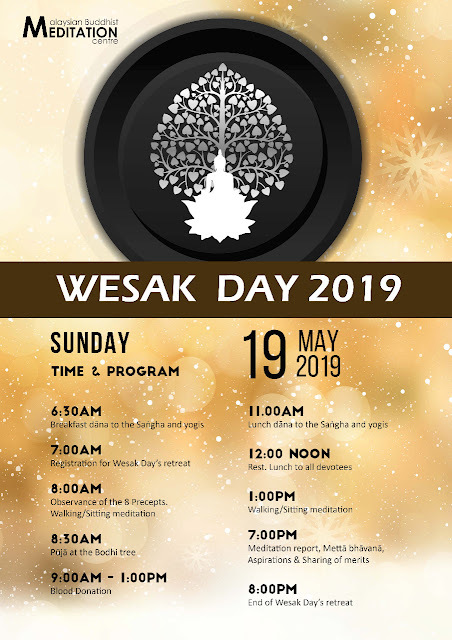 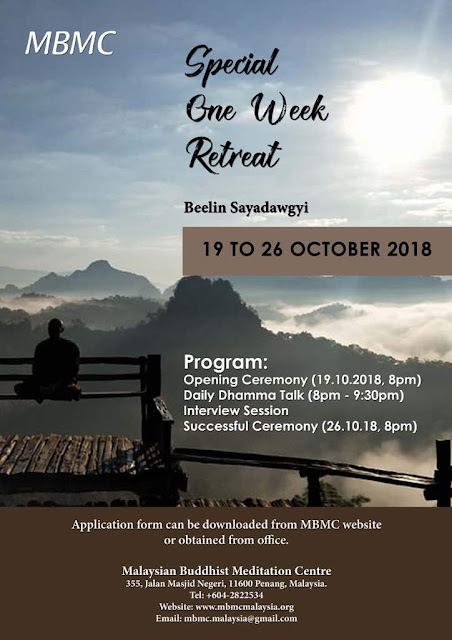 Anyone who is interested to attend the retreat, please download the meditation retreat application form, fill up and email to mbmc.malaysia@gmail.com or you can register at MBMC office. 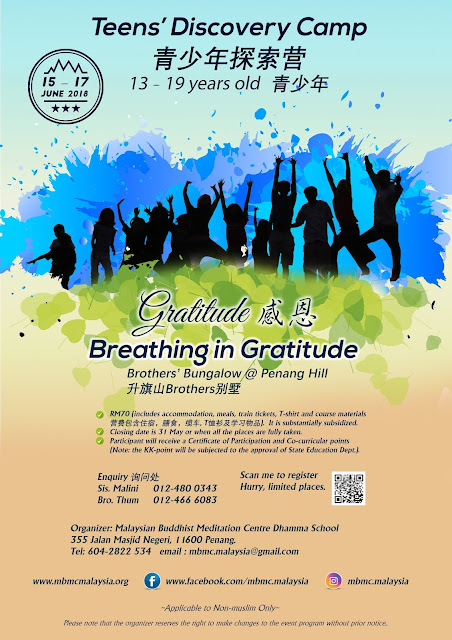 2018 MBMC Teen's Discovery Camp "Gratitude – Breathing In Gratitude"
MBMC Dhamma School is organising an inspiring learning camp for teenagers from 15th to 17th June 2018 during the mid-year holidays, with the theme “Gratitude – Breathing In Gratitude”. 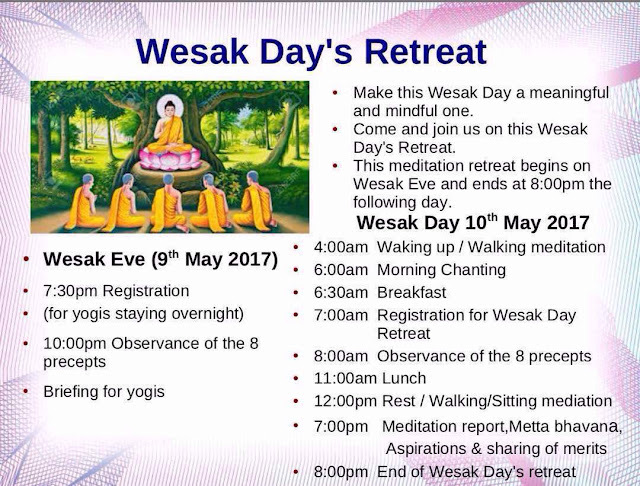 The purpose of the camp is to inculcate gratitude as a skillful mental quality in developing healthy mind and good relationship. 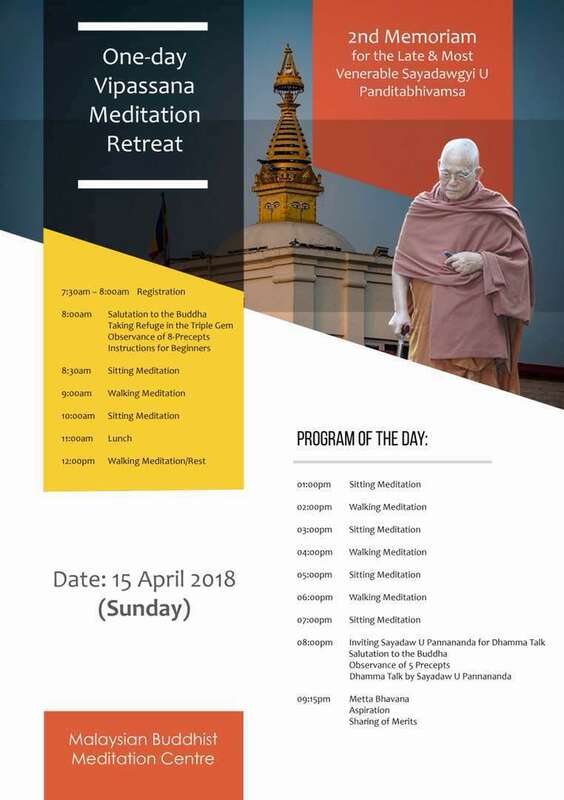 The camp will impart skills and knowledge rooted in Dhamma to all participants through interesting talks, group activities, interactive sessions, and quiet meditation. The 3-day camp conducts in bilingual (English & Mandarin) and it is specially designed for teenagers aged 13 to 19, you are welcome to join this enriching camp. The camp will be held at Brothers’ Bungalow, Penang Hill. Camp’s registration fee of RM70 per participant will be collected; it includes accommodation, train’s ticket, meals, T-shirt and camp materials. 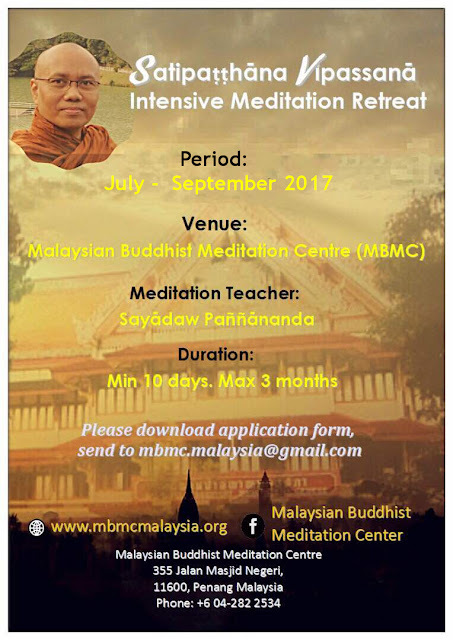 Kindly contact Sis. 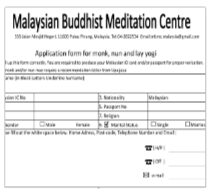 Malini at 012-480 0343 or Bro. Thum at 012-466 6083 for enquiries. 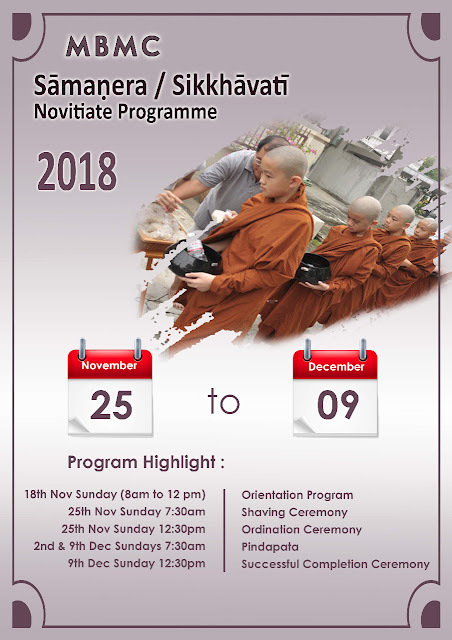 Please share news of this wonderful learning opportunity with your relatives and friends. 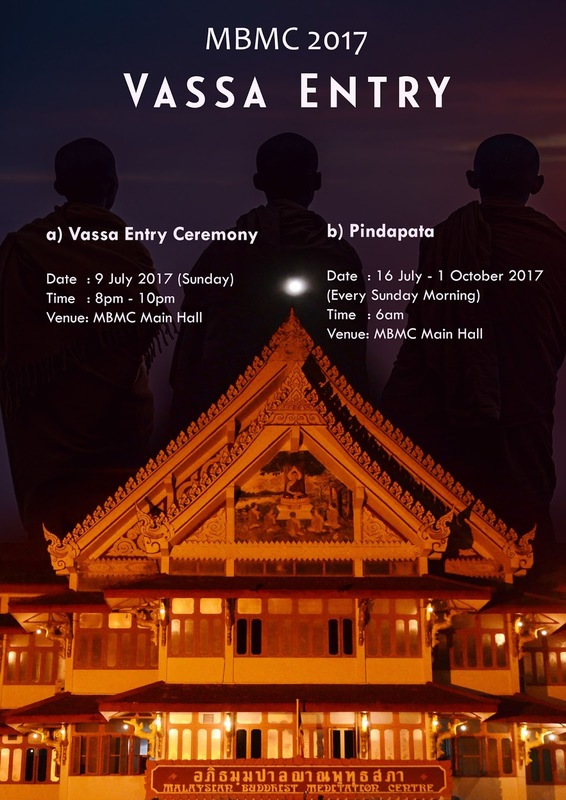 We look forward to your participation! 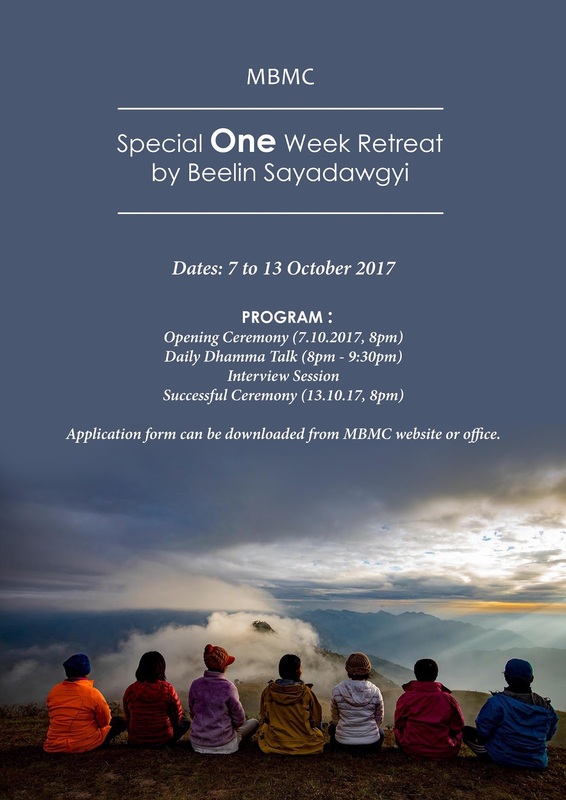 The camp is only available for Non-Muslim. Thank you. To commemorate the late Sayadawgyi U Panditabhivamsa, MBMC organizes a One-Day Vipassana Meditation Retreat on 15 April 2018 from 8.00am to 9.30pm. 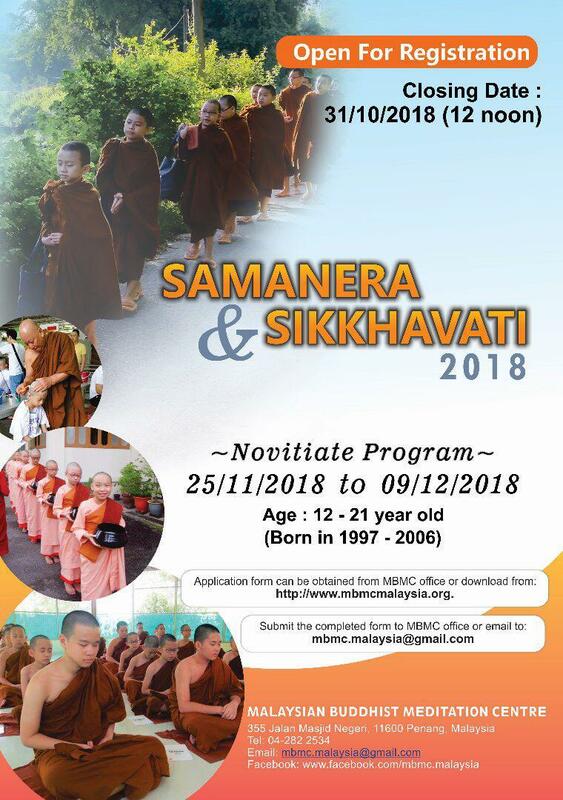 Anyone who is interested, please come at 7.30am to register yourself. 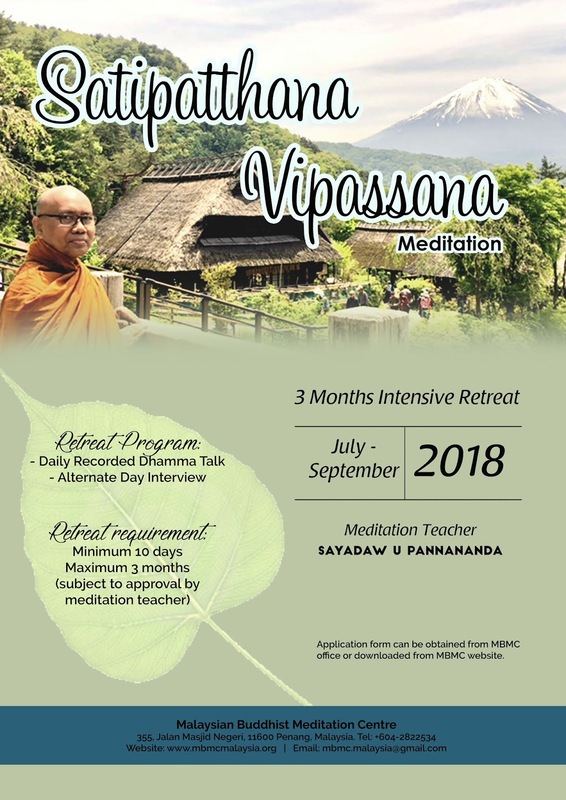 Minimum requirement is 10 days.